UPDATE: the KSD6 dome port is available via Amazon, click here for the link. As mentioned in my video on the GoPro pistol grip triggers that are available KNEKT have been working on a dome port for your GoPro camera. This is our most ambitious undertaking yet! 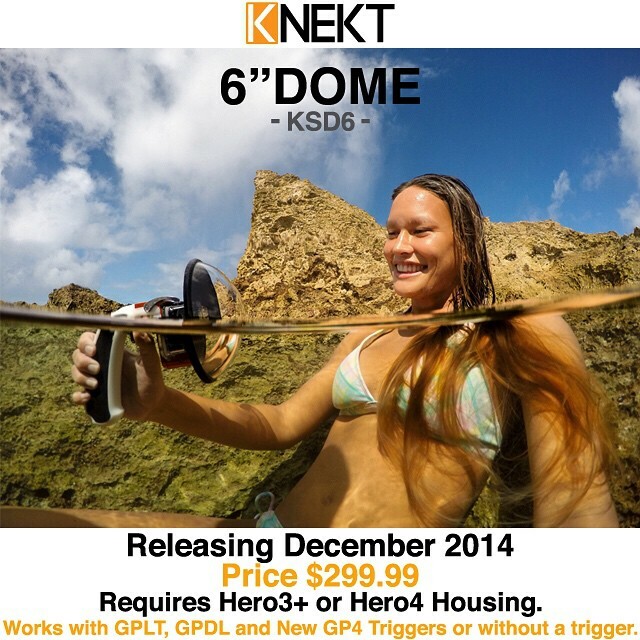 The KNEKT KDS6 Dome is unlike anything on the market. Full camera power and mode control provide unlimited possibilities. Works with select triggers or as a standalone product. In this image @key_ana808 uses the KDS6 to capture a selfie in paradise. Go check out her feed for the results. As you can see from this announcement via their Instagram page, it will be available in December and it’s got a diameter of 6″, slightly bigger than the 5″ dome I tried out from SPL, but smaller than SPL’s other options. It costs $299 and it attaches to a standard GoPro Hero 3+ or Hero 4 housing, it also promises control over the front button on the GoPro, something that was missing from the SPL version. If you’re wondering why you’d want to use a dome like this, check out my video on the subject. It’s compatible with the excellent GPLT trigger that I’ve used, and their other trigger systems. When I find out more I’ll post another update, I’m looking forward to seeing how they’ve managed to allow full control of the camera. I’m sure there are lots of other people waiting on a re-stock too, it looks like a great product.